Choosing Apartment Furniture: What Should You Know? When you ponder the future, how do you foresee the architecture future? Maybe that question throws you for a loop. After all, how can anyone really tell what future buildings will look like when today’s trends keep changing? But the future is near, there are already hundreds of projects created to fulfill the needs and wants of a new generation. One very interesting concept is that of hypnotic bridges. Instead of the same old hanging bridges and curved overpasses we’re so used to that we hardly notice them anymore, these bridges are like one of those wild and loopy roller coaster rides at your favorite theme park. 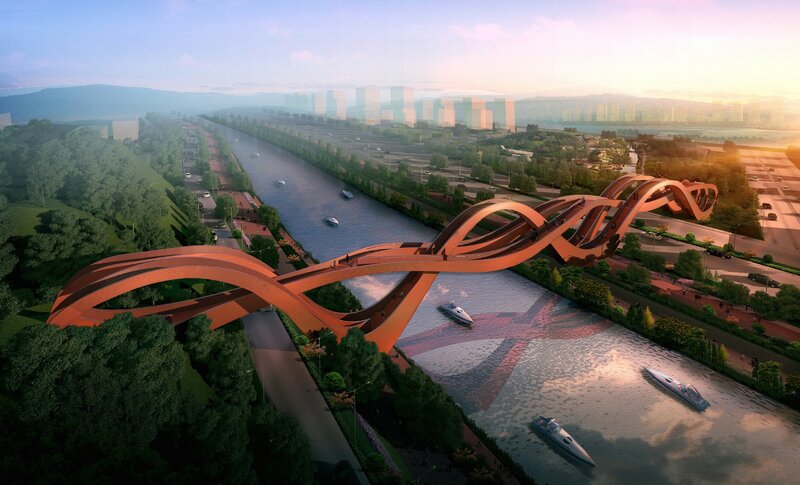 Take for example the Dragon King Harbour River footbridge in China. A marvel of the architectural design. The bridge was intended as a footbridge over the river, but became something much more. A symbol of the ambition, determination and creativity of an entire country. The design is composed of three individual, almost dizzying lanes hanging over Changsha. This fascinating piece of construction has connections that crisscross over each other, and altogether has the appearance of some wild serpentine creature. And then there are the rotating skyscrapers. Back in 2008, in Dubai, a clever architect came up with the idea for an enormous building tall enough to reach Mt. Olympus. It would have floors that move without seeming to move at all. This design would provide wind generated electricity for tenants, and penthouse residents would be able to park their car at their apartments thanks to lifts. Of course you can’t be afraid of heights to live in this newfangled wonder. While the skyscraper design has yet to become reality, there seems to be more hope for this indoor park concept. In 2013, there was an international competition to design Zaryadye Park, destined to be Moscow’s first new public park in over 50 years. The park will feature four landscapes — tundra, steppe forest and wetland, all atmosphere controlled to enable the park to function as a public space throughout Russia’s extreme winters. In the ultimate architecture future inspiration, there will be regulated temperatures, controlled wind and simulated daylight that encourage park attendance 24/7. Winter can’t close this park. These days there are lots of architects that can create wonderful designs for your house. Search all over the internet for them and choose wise the perfect style for living. They are able to design amazing structures from exterior to interior and are using bright ideas for them. From time to time there is a new type of house built by architects. They are using incredible architecture future designs when they create the sketches. There are lots of designs they can use, and combining modern style with the history of building zone will result in outstanding living house. If there is a river that flows through a city, architects will have a good strategic location for new houses. The building shape must be distinguished from the other houses nearby. The semitransparent front part of the house is made of glasses so the sun can light the rooms. Everyone wants a beautiful home, and if you happen to have the means, a contemporary home that can be both creative and modern, yet look toward the future just might be tops on your list of housing choices. While contemporary architecture is all around us, designing a house to satisfy those requirements can necessitate some creativity. One example of this is The Skyline Residence, Hollywood Hills. This house was designed with the sun and wind in mind, so it was strategically placed along a sharp ridgeline that overlooks Los Angeles. The effect of this clever placement is that natural light constantly radiates into the mostly glass home, plus inside a single corridor is all that’s needed to keep the heat out of the bedrooms. And in another astute touch there are doors installed on two opposite sides of the house, which when opened provide a nice flow of air throughout. There is also an outdoor theater which shows movies on the side of the home. Now consider the Rising Glen Residence, Los Angeles. Here the designers thwarted the usual Los Angeles sprawl by creating a one-story suburban home that somehow manages to contain four bedrooms, a wine room, two home theaters, plus jam a pool complete with an incredible, underground stereo system, a private yoga studio and a spa all indoors. All nestled snugly amidst an enclave of trees. Our next example of architecture future design inspiration is the Beverly Skyline Residence, Texas. Now the architects working on this creation were really thinking about the environment. They used recycled glass blocks for the front of the house, with wooden slats acting as rain screens to catch rainwater which is later distributed to the ponds and streams that are all about the home. The steep lot gives the illusion of a Japanese temple, and there are expansive views of the city which is close by. An architect must always be forward looking, innovative, and sometimes even able to anticipate what the future will hold. They must be able to let their imagination run free, yet know when to reign it in. They must also be clever, yet subtle. If he can do that anything is possible. Hi, I'm Tim. I write about all things dream house, from curb appeal to the backyard swimming pool. I believe everyone has their dream house in mind and I hope to do a small part in inspiring ideas that will help you turn your dream into a reality.